Batzenhofen (Bavaria, Germany) is situated at the left bank of the river Schmutter near the eastern foothills of the so called "Rauher Forst" (i.e. desolate forest), which belongs to the nature park Augsburg western forests. The hilly area of the rural commune shows heights between 449 and 520 meters above sea level. The municipality can look back on a long and eventful history. At the Katharinaberg more than 500 regularly dug pits were found, which experts dated to the time of the Celts about 500 BC. The origin of the village happened probably around 800, when many places ending with "...hofen" were founded. The early name Pazcinhova is interpreted as "Hof des Bazzo" (i.e. farm of Bazzo with Bazzo = fighter), but may also be a connection of the latin "pascua" (= pasture) and the alemannian "hofa, hufa, huba" (= farmstead). The name Pazcinhova already in the 13th Century had developed to "Bazenhoven" as a forerunner of the today's name Batzenhofen. Until 838 Batzenhofen belonged to the convent of Kempten and 969 parts of Batzenhofen were given to the monastery St. Stephan, which was founded by bishop Ulrich in that time. Because of this deed of donation the village could celebrate it's 1000 year anniversary already in 1969. Bishop Ulrich of Augsburg recorded in 969 the foundation of the Kanonissen convent St. Stephan. 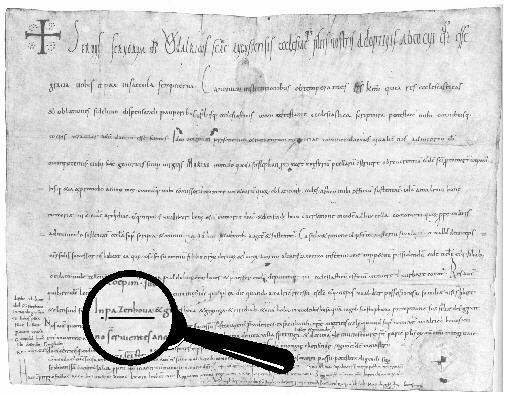 The document shows a reference to Batzenhofen ("Pazenhoua"). The monastery of St. Stephan built a castle, that was used as summer residence and recreation place by the ladies of the convent. Later were added a brewery and a tavern. In 1925 the whole complex was sold to the "Innere Mission" and since then used as old people's home "Sonnenhof". Gradually the whole village came into possession of the convent, which ruled up to the secularization in 1803. From this time, when her Grace, the high aristocrat Abbess of the Realm-free ladies Convent St. Stephan of Augsburg was sovereign over Batzenhofen, the following directive is delivered to us: "With true pain and to our highest displeasure we had get to know the fact, that the peasants of our rule Batzenhofen in their perverseness go so far, not only to shave themselves but sometimes even shave one another. Why in our motherly solicitude we did set up an examined and well experienced barber in each of our villages? Therefore we order a new, that from now on everyone of our subjects proceeds at least once a week to his by high authority set up barber and neither shaves himself nor let scrape off his beard by someone else." 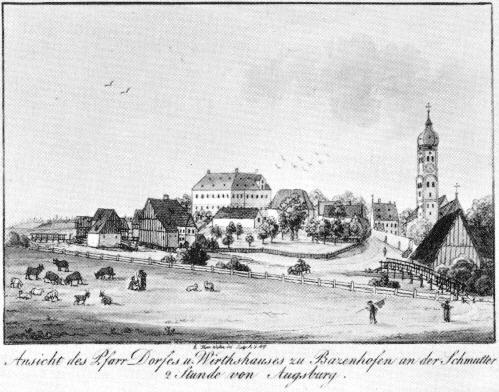 View of Batzenhofen with brewery and parish church. Copperplate engraving by Thomas Weber from the year 1795. The oldest list of properties of St. Stephan mentions in the year 1401 seven estates in Batzenhofen, four farms and three mercenary houses. In 1492, when Columbus sailed to America, Batzenhofen already had 22 buildings with fireplace inside. "Bet Kind bet, morgen kommt der Schwed'" (i.e. pray child pray, tomorrow comes the Swede), this call also echoed through the peaceful village in the Schmutter valley. In the Thirty Years' War many houses were destroyed and half of the inhabitants died. In 1738 there were 47 houses. This number remained almost unchanged for more than hundred years. The Napoleon Wars 1805 to 1815, the wars of 1866 and 1870/71 and the two World Wars demanded their tributes, the latter also between the civilian population again. Older people of Batzenhofen still remember 27th February 1945, when World War II brought death and destruction to the middle of the village: A bomb hit the schoolyard and tore teacher Pesta together with his wife and Ms Hummel out of life. A fresco at the right side of the choir in the parish church St. Martin reminds of this bad day. The current parish church was rebuilt in the years 1719 and 1720, using the structural fabric of a house of worship existing since 1500: Parts of the gothic choir and the steeple were integrated into the new building. The parsonage, built in 1705, is one of the oldest in the district. In 1766 the chapel dedicated to St. Sebastian was built. Believing the legend, the chapel should be built at the highest point of the village, the former Thing place with the mighty old oak. But night after night the building material as if by magic moved down to the place where you can find the chapel today. 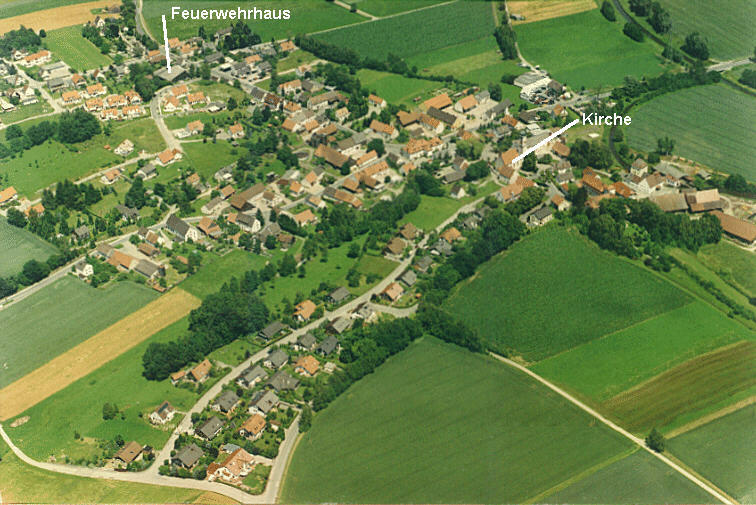 But the name "Kirchberg" (= church hill) remained until today for that place and confuses visitors of the village. The school, built in 1908, was given up 1969 because of the school reform and pulled down later. In the year 1912 the modern trend came to Batzenhofen, when the village got it's connection to electrical power. For electrical lightning Batzenhofen had to wait until 1954 however. In 1958 main street was tarred and parts of the town got a sewage system. 1966 the private wells could be closed, when the central water supply plant was put into operation. It should last additional 10 years to solve the question of waste water by a new sewage system. In 1975 a community hall with fire station was built. Three years later the history of Batzenhofen as an independent municipality ended and the village got incorporated to the city of Gersthofen. This caused the classification of further construction sites. The center of the village got closed by the development of both Katharinaberg and Kirchberg. The central position of Batzenhofen between the western parts of town Edenbergen, Hirblingen and Rettenbergen made it possible to built a parish hall with kindergarten, that is used since 1994. It can be assumed that the calm village because of it's location close to Augsburg will prosper successfully in the shade of Gersthofen without losing it's own character.